With a very modern style the Winchester 8ft x 4ft Greenhouse Lean to Pent Unit is one classy looking and very practical lean to greenhouse. This 8 X 4 greenhouse will snugly fit up against an existing structure, so even more modestly sized gardens can enjoy this. Even with its design, you still have plenty of room inside and will be able to walk around comfortably taking care of your plants and growing your tasty food. 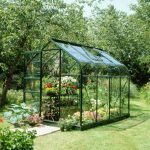 The greenhouse has been designed very well and it certainly has an eye catching look that will certainly make it a focal point of your garden. The large windows and opening vent on the roof ensure your plants and food get all the exposure to the elements they need. This is one very well made lean to greenhouse. The tongue and groove cladding is 12 mm thick and this is supported with a thick frame that makes it a very strong greenhouse. The windows are all made from high quality styrene so plenty of sunlight will get inside and there is no risk of broken glass. The price you see at the top of the page even includes and installation service. Although you can decide against this if you want. The Winchester 8ft x 4ft Greenhouse Lean to Pent Unit is a fantastic lean to greenhouse that is ideal for those of you who want a decent amount of space to exercise your green thumbs, but lack a large garden to do so. This greenhouse will slide up against another structure like your house so it does not take up a ton of room. For a lean to, this is actually a very nice size. It is 8 feet 2 inches deep and just a little over 4 feet wide so you can get inside and move around comfortable and most importantly of all have plenty of space to grow things. At its highest point the greenhouse stands at well over six feet tall, 6 feet 8 inches to be precise. This means you can have some high shelves in here to really help maximise the space. One other thing we have to mention is that the price you see at the top of the screen does actually include an installation service. 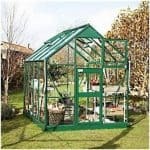 As this is a lean to greenhouse, Winchester have gone for a pent style roof and we feel that is the right decision. As the door is on the front end, the rain will not run off over the door which we feel was a smart design choice. The roof is made with a strong timber frame and long styrene panels. The way the frame is made means that there is not lots of wood in the way of the plants and food you have in the greenhouse so plenty of light gets in through the roof. There is also an opening vent on the roof so you can let in some fresh air if needed. Along the bottom of the Winchester 8ft x 4ft Greenhouse Lean to Pent Unit is some very smart looking vertical cladding. We really like the way this looks and feel it gives the greenhouse a very modern look. The cladding is some high quality stuff as well as it is 12 mm thick tongue and groove cladding so you have no worries about rain sneaking its way inside. A 45 mm x 27 mm frame is what is keeping this structure together and honestly we are very impressed with this. The frame will make sure that this lean to greenhouse is very strong. Not just strong, but it also means it is going to last many, many years. The thickness of this frame and the timber they have used will ensure this greenhouse lasts for a long time and does not become flimsy like some weaker frames can do. 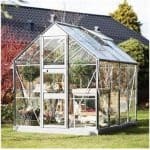 No floor is included with this greenhouse, but that is the case for the majority of greenhouse in this style we have seen. The idea is that you will be installing it on concrete or even a decking area so there is no need for a floor. The Winchester 8ft x 4ft Greenhouse Lean to Pent Unit will be sent to you with a base coat treatment and in our experience this is good for a couple of weeks. You though will have to give it a good coating of wood treatment to make sure the timber is protected from the elements. We recommend doing this soon after construction and then on an annual basis. It really will not take long and if you look after the timber then you are going to get a good couple of decades out of this. While this is a very impressive lean to greenhouse, we are just as impressed with the warranty that Winchester are giving with it. Now for their warranty to be valid, you do have to treat the wood, but this is something you should be doing anyway. If you do this then you are covered by a ten year anti rot warranty. The door is located on the front and while it is a single sized door we are very happy with the size of it. It is 5 feet 8 inches high and 2 feet 4 inches wide. This is as good as a single door on a shed, so you will find getting your items in and out no trouble at all. The door has a very sturdy handle and some very smart looking hinges that we feel just finishes of the greenhouse perfectly. Like the panels on the roof, styrene is used for the rest of the panels on the greenhouse. This includes the one that is on the door also. Making them with styrene was a very smart decision as it takes away the danger of broken glass. Also it is very easy to look after and just a quick blast with the hose or a wipe down with a sponge and keep the panels clear. The door has an proper lock on it so you can securely lock this up at night. This is great if you are growing some tasty strawberries or other kinds of food in here and you do not want the kids or grandkids giving them to their friends. This lean to greenhouse is probably as secure as you are going to get. Even the vent on the roof can be securely locked so with that and the door, you have a secure greenhouse on your hands here. The Winchester 8ft x 4ft Greenhouse Lean to Pent Unit gives you about as much privacy as you are going to get with a greenhouse. 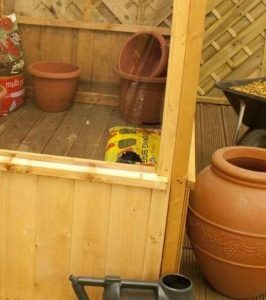 One thing we will say though is that since the bottom has cladding, you could always lay your tools you use to tend to you plants and food down next to it or under a table and the cladding would hide them a little bit. So while not a lot of security, it is more than greenhouses which just have glass panels provide. Winchester are not offering any official customisation options with this, but you could always give it a little bit of colour with the help of some coloured wood treatment. While we like the natural look of the timber, you can get wood treatment in a number of different colours so be sure to have a look. There are a few extras available with this lean to greenhouse. First of all though we want to mention the installation service. The price we have at the top as we said earlier does include an installation service and that is the default option of this greenhouse. But you can opt out of this if you want. 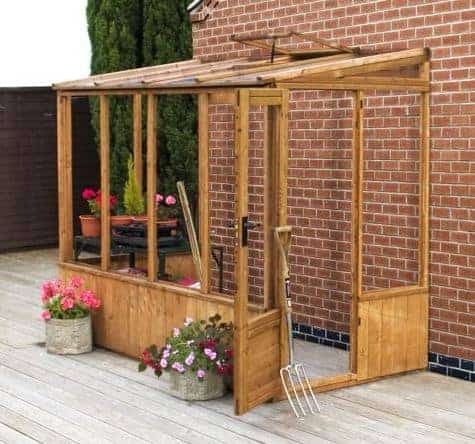 If you decide against the installation service then the price of this greenhouse is £689.99, which makes the installation £150 which is quite a lot add. This is not an overly hard installation so have a think about doing it yourself and you can save a lot of money. Now they do have a few extras to talk about. First of all is the Gardman Solar Shed Light which for £16.99 will give you a bit of light inside the greenhouse. While we feel the level of security offered by the lock on the door is fine, you can add a Security Hasp and Padlock Set for the very reasonable price of £4.99 if you want a little bit more security. We are very impressed with this greenhouse and feel they have done an amazing job with its design. While some may wish it had proper glass windows, we feel styrene for this design was the right choice. The actual structure is very solid and will stay strong for many years, but that lovely looking timber is going to be reliant on you remembering to treat it once a year. 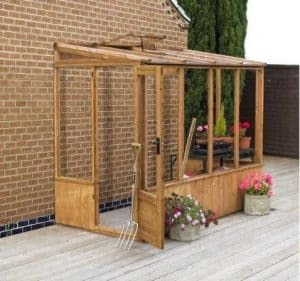 We feel that this is a very good size for a lean to greenhouse and are sure you are going to be able to make this space go very far with the help of a table and some shelving. The default version of this greenhouse comes with an installation service so you have nothing to worry about. If you decide against this, you will need another person to help and you are looking at 6-8 hours at the most. We would score an manual installation at a 8.5. We feel the price for the version that includes installation is a little high and may put some people off before they even realise this is not a mandatory option. Without the installation, we actually feel that the price is very reasonable. Final Thoughts: We really like the Winchester 8ft x 4ft Greenhouse Lean to Pent Unit and feel that Winchester have really done an incredible job with it. 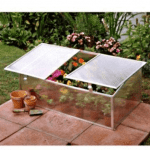 The size is just ideal for a lean to greenhouse and it offers you far more space than the pictures suggest. It is made with some very good materials and we have no doubts that as long as you look after the timber properly that you will get at least 20 years out of this. The price may seem a little high, but this does include installation. Plus if you are even the slightest bit DIY handy then you can manually install it, saving yourself a fair bit of money in the process.